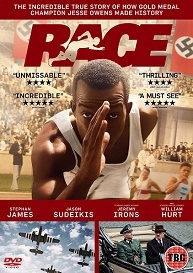 Tense and uplifting RACE is based on the true life story of track and field sensation Jesse Owens, who at the 1936 Olympics not only found his battles in the stadium but within society as well. To celebrate the release on DVD, Digital Download and VOD from October 10, we’re giving you the chance to win a copy of the film! Discovered whilst attending Ohio State University in the early 1930s Jesse soon found himself gaining national recognition for breaking numerous athletic records. As the Olympics approached, which were to be held in Nazi Germany, there was much debate across the world as to what countries would be attending and for Jesse in particular the question of whether a black man should visit such a racist country. With the US eventually deciding not to boycott the games, Jesse soon found himself at the centre of racial animosity both on and off the field, at home and in Germany. With the world looking on Jesse used the opportunity to prove himself as the fastest man alive – coming home with a record breaking four Gold Medals, whilst also turning Hitler’s theory on its head. Inspiring and provocative, RACE is one man’s story of triumph over adversity, and a reminder that although we don’t all have Jesse’s talents, we can all stand up and make a difference. For your chance to win, simply watch the trailer and answer the question below.